You’ve listened to all of the buzz about how great Pinterest can be for your small business, and took it upon yourself to set up your very own Pinterest Page. You may have even gone as far as to post your first board! Leverage all of the social channels you currently use to tell your friends, family, and customers about your new Pinterest Page. Also, be sure to include visually-enticing pins from some of your favorite boards within your posts to really get people’s attention. If you have a business blog, you can actually embed a pin or an entire board using Pinterest’s widget builder too. This is a great way to drive people to your page. You’ll also want to take your efforts offline as well. Just because Pinterest is an online social network doesn’t mean that you shouldn’t promote your Pinterest Page within all of your print marketing materials, including business cards, menus, flyers, signs, t-shirts — anywhere it can be visible. Tell every customer who walks through your doors about it. This is all part of getting the word out. Yes that’s right. Similar to Twitter, Pinterest has a tagging system using the same hashtag method. Use hashtags in the descriptions of your pins so that even more people can find them. It’s a great way to have your Pinterest account and pins discovered by people searching through related content. Keep in mind that the people who find these pins will be very interested in them too because of the way they found them. 3. Send out a special email. Create an email specifically dedicated to encouraging your customers to follow your boards on Pinterest. By doing so, you’ll be able to tell all of your customers about your new page quickly and they can start following you straight from that email. Remember to include some great images in there also. Afterall, Pinterest is all about the visual appeal. 80.5 percent of small business websites do not link to social media networks. Don’t make this common mistake. Not connecting your website to your social networks is a bad practice for all social networks, and especially for Pinterest. Adding a Pinterest logo to your website will not only help drive traffic to your page, but will act as a reminder to people who visit your website to pin your content. The nature of Pinterest is based on collaboration. Find other local businesses in your area to engage with and stay updated on what your customers are pinning alongside items from your business. 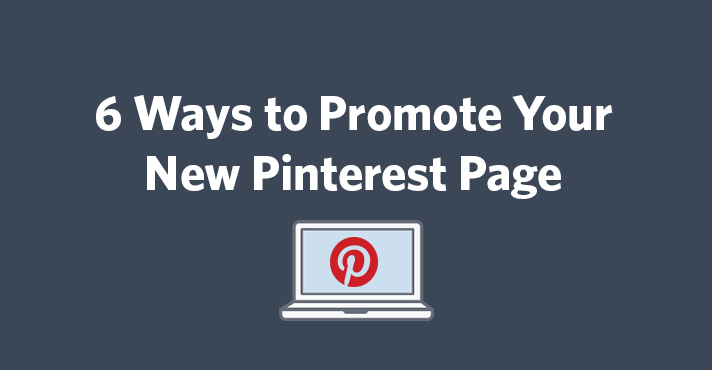 Also, look to other businesses similar to yours on Pinterest for inspiration. 6. Make it easy for people to find you. Update your “Search Privacy” to allow your boards and profile to appear in search engine results. Be sure you fill out the description sections of your boards and pins so that users searching can find you too. Feeling like you need a few more Pinterest resources? No worries! We have you covered. Here’s a helpful guide about how to drive social visibility and new business with Pinterest. It’s also good to know what not to do on Pinterest to avoid looking dumb. Other than that, have some fun! Happy pinning! If you have any additional questions about promoting your Pinterest Page, feel free to leave them below.